Doctors aren’t just the highest-paid professionals in America. They’re also the most admired. That’s according to a new Harris Poll study conducted online in the US among 2,537 adults. 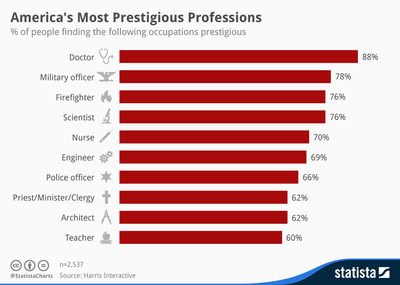 Survey respondents were shown a list of occupations and asked how much prestige each job had. A whopping 88% considered doctors to either have “some” or “a great deal of” prestige. Others among the top 10 include military officer, firefighter, police officer, and nurse. McCarthy believes that people today define prestige as “a mixture of envy, respect, and admiration.” Meanwhile, Shannon-Missal thinks everyone has their own definition. “This is part of why we leave it open in our questioning, allowing it to mean whatever it means to the respondent,” he explains. Click here to see the full Harris Poll report.